SCM « Global Market Insights, Inc. Technological advancements and digitization is setting high goals for the enterprise application market, which is expected to hit a revenue of USD 287.7 billion by 2024, as per Global Market Insights, Inc. Enterprise application is a highly complex system deployed across corporate bodies to ensure real- time information flow along with smooth business operations. 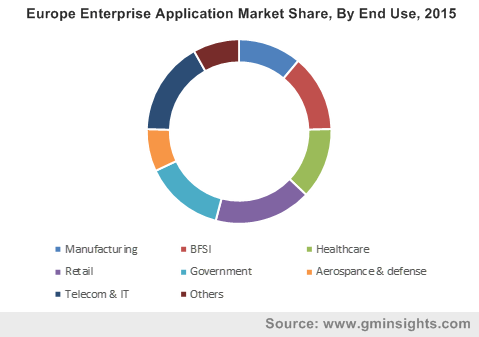 Growing demand for efficient IT infrastructure, rising internet connectivity, rapid adoption of cloud computing technologies, and growth in smartphones and mobile devices are the vital factors influencing the enterprise application market share worldwide.A huge adoption trend across various end-use industries such as Healthcare, BFSI, Manufacturing, Government, Retail, Telecom & IT, and Aerospace & Defense is boosting the global enterprise application market size. Enterprise application provides these industries with a wide set of solutions such as CRM, SCM, ERP, Business Intelligence [BI], Web Conferencing, BPM, EAM, and CMS. These solutions enable the users with better inventory management, quality management, customer engagement, and supply chain management. ERP market which accounted for 20% of the overall enterprise application share in 2015, is anticipated to register a CAGR of 7.7% over the coming eight years. Website content management, which has become an integral part of any organization is driving the growth of the CMS (Content Management System) market. CMS market share is estimated to exceed USD 8.5 billion by 2024. Owing to the growing demand for customer engagement management, CRM segment will also witness significant growth over the coming years, accounting for over 25% of the overall enterprise application market share by 2024. Cloud based enterprise application, which accounted for 30% of the overall share in 2015, is gaining popularity among various sectors, particularly manufacturing and retail, due to increasing focus on cost optimization, growing internet connectivity and demand for enhanced accessibility. Also, on-premise deployment model is projected to witness a CAGR of 4.5% over the period of 2016-2024. The implementation of enterprise application across various industries solely depends upon the requirements from the respective sectors. Enterprise application in the healthcare industry was worth USD 16.5 billion in 2015 and is forecast to grow at a CAGR of 8.9% from 2016-2024. The growth will primarily be driven by growing demand for real-time data transparency across this sector. Retail industry will also witness huge adoption of this system to ensure better customer management. Global enterprise application market worth USD 150 billion in 2015, is forecast to register a CAGR of 7.6% over the period of 2016-2024. 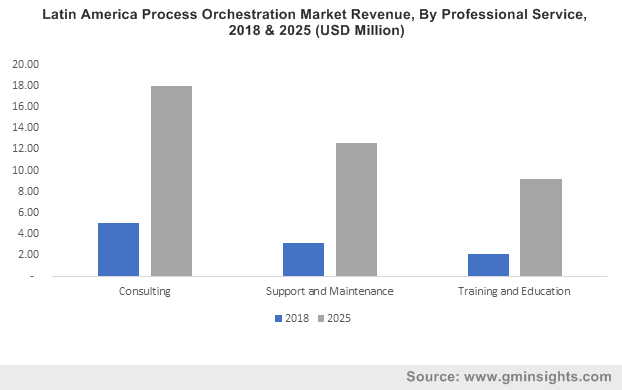 The North America market size is estimated to account for 30% of the overall revenue by 2024, driven by modern organizational structure and customer-centric approach of the companies across this region. The Asia Pacific market is anticipated to record a CAGR of 9.5% over the coming eight years, hitting USD 75 billion by 2024. Technological advancements coupled with cloud-based solution demand by SMBs is likely to drive the regional demand. Novel IT developments like Big Data and Internet of things will bring immense growth opportunities for the market players. The participants will spend largely on R&D to develop innovative products and solutions in order to meet growing technological needs and most importantly to sustain competition. Startups and small scale industries will also share decent business space over the coming timeframe. Key market participants are IBM, Oracle, , Microsoft, SAP, Epicor Software, IFS, Infor, Hewlett-Packard, and QAD. This entry was posted in Electronics and Media and tagged BI, BPM, Business Intelligence, CMS, CRM, EAM, Enterprise Application Integration, Enterprise Application Market, Enterprise Application Market Growth, Enterprise Application Market Share, Enterprise Application Market Size, Enterprise Software, ERP, Global Enterprise Application Market, Manufacturing, SCM, Web Conferencing.